Fall Home Show 2014 – Tickets Giveaway! In case you didn’t catch it, yesterday on the blog I revealed my Fall Home Show Upcycle Challenge project (Vote for me here!). But today, I wanted to give you the low-down on some of the other great things in store at this year’s Toronto Fall Home Show which runs September 17th to the 21st, 2014 at the Better Living Center. First up, if you follow design shows, you will know one of the show’s headliner’s VERY well. It’s TOMMY! Yes, I’m talking about HGTV star, Sarah Richardson’s right hand man, designer extraordinaire and the most insane #hashtager ever (follow him on instagram and you’ll see), Mr. Tommy Smythe! He will be presenting on the main stage on Saturday, September 19th. And as a blogger, I certainly know the name Marion Parsons as I have read her DIY/Decor blog Miss Mustard Seed a lot over the years. Along with her blog, Marion has created her own brand of Miss Mustard Seed Milk Paint which has been very successful. She is also a freelance writer, stylist and photographer, an antiques dealer, and the author of the book Inspired You. She is going to be appearing daily on the main stage talking about the Flipping Furniture! There are many other presentations from design celebrities like Emmanuel Belliveau and Leigh-Anne Allaire-Perrault, not to mention cheesy goodness presentations from Keven Durkee from Cheesewerks! (you can see the full stage schedule here). And these presentations are over and above the more than 100 exhibitor booths you can peruse for all your home reno and decor needs. Also be sure to visit the Habitat for Humanity Restore booth and bid to take home one of the fabulous Upcycle Challenge pieces, with all proceeds going to Habitat! (And while you are clicked over on that page if you could throw a vote my way for the competition I would be most appreciative!). 1. Leave a comment below telling me how much you would like to attend the show! Please provide a separate comment for each entry. Contest ends Sunday, September 14th, 2104 at 11:59 pm. Winners will be selected randomly using Random.org and will be announced on Monday, September 15th, 2014. Good Luck! I would love to live in a padded room. Although some days I do feel like I’m beating my head against a wall and could use a soft spot to do it, I’m not talking about that kind of padded room. I’m talking about upholstered walls. Being a part-time upholsterer, I’m always looking for interesting ways to use upholstery, and this certainly falls into that category. 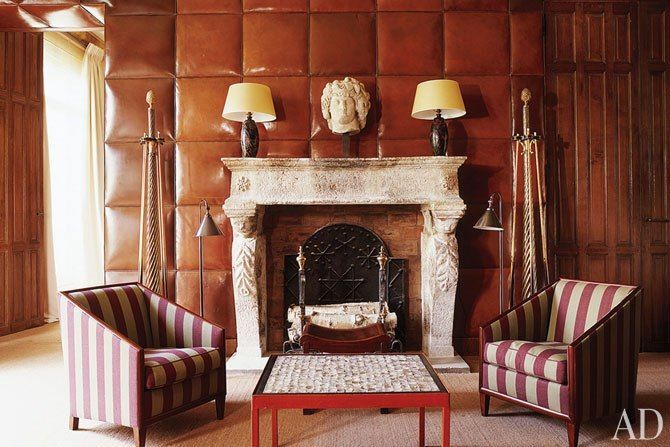 I love the texture that they bring to a space. Some are very overt with large tufting or finished with nail-head trim, while others are quite subtle. But whatever the type, they are a great addition to a space. 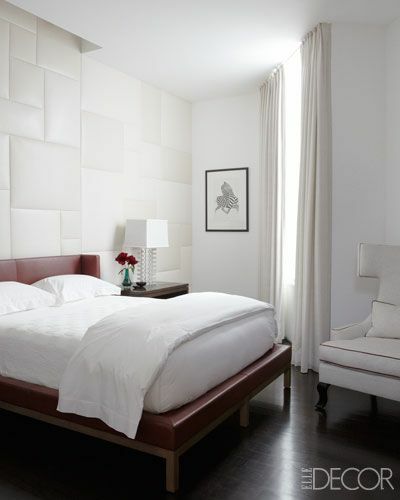 What do you think of upholstered walls? Is it something you would do in your space? When I stumbled upon the farmhouse of New York restaurateur Keith McNally (of Balthazar restaurant) in Elle Decor, it reminded me of some of the older farmhouses in New Brunswick. Though this one is located in posh Martha’s Vineyard, you wouldn’t know it as his renovation has kept the property rustic and simple. But genuinely beautiful. They raise animals, grow produce and even make their own goat cheese here. And the gardens are amazing. I just had to share this lovely spot with you. Pretty great, huh? What a great place for kids too. I hope you enjoyed as much as I did. I’ve been working on getting my backyard/patio cleaned up over the last few weeks, and I’m making some changes to the space. Nothing drastic, just some updates while using the furniture I already have. You may have seen my recent post about painting my exterior door. After getting lots of opinions from you (thank you! ), I’ve decided on the blue, more specifically Para Paints Bluenose (P2116-03). That decision led me to a create a nautical-ish navy/red scheme. I’ve done a round-up on what I have already and what I will need to complete my look. 4. ÄPPLARÖ gateleg table from IKEA. 1. Patio lights! The string kind. Simple ones I can drape around my patio or in my garden for extra light. Like these Allen & Ross ones from Lowe’s. 4. Good quality stake lighting for my garden. The solar ones that I currently have are terrible and don’t emit enough light, but I don’t want to have to run a cord across my yard from my deck so I’m stuck with solar. I like the look of these copper ones from Westinghouse. But I’ll definitely want to be sure the ones I buy give off sufficient light. So what do you think of the scheme? Any suggestions? Any recommendations for good stake lighting that actually gives off good light? Let me know! My weekend + a Giveaway ! You know when you are coming up to a weekend and you don’t think it’s going to be busy but then it is? I had one of those weekends. As some of you math-y types like myself may know, Friday March 14th was Pi Day (3.14….get it?). My friend hosted a little impromptu dinner party for Pi Day where we ate all things Pi (or pie). There was Sheppard’s pie, tortiere and pizza pie (complete with the Pi Symbol made of pepperoni). We nerds really know how to let loose…..
And I also attended the National Home Show and Canada Blooms at the Direct Energy Centre on Saturday. It was really busy and I didn’t have a lot of time so my focus was on the Canada Blooms side since I am so excited to start my garden this year. I’ve already started some of my seeds. Canada Blooms is the perfect spot to find inspiration for your garden. They also have tons of experts presenting throughout the week on the main stage providing great gardening advice. There were lovely walking gardens and a series of runway fashions made from flowers. And I bought some new seeds to try out this year. On top of it the National Home Show portion has hundreds of exhibitors as well as a ton of design, DIY and renovation experts presenting on the main stage this week/weekend including, Brian Baumler, Glen and Jamie Peloso, Jane Lockhart, Leigh-Ann Allaire Perrault and more. You can see the whole schedule here. The show is happening all week until March 23rd. And the good news if you were hoping to go this weekend I have 3 pairs of tickets to giveaway! All you have to do is submit a comment below to enter! Contest closes Wednesday, March 19th at 5 pm EST. Winners will be selected at random using Random.org. Good Luck! All product information can be found on my Polyvore page, here. I used the IKEA stockholm sofa in a gorgeous kelly green as the base. Then I added those gorgeous round-back armchairs and layered it wooden and marble accents pieces. To add a pop of colour I used a dark cranberry morrocan style rug and some throw pillows. I have to say, I’m really liking the green and cranberry colour combo. What do you think? I am slowly working on getting my dining area in my kitchen complete. Round gate-leg table stripped and painted….check. Two new dining chairs…..check. But the next step is what to put along the wall of the dining area. You see I would like to be able to put the table leaf down along the wall most of the time, which doesn’t really allow for 2 additional chairs on the inside…..but what just might work is a banquette. Plus, with a banquette I might be able to get some additional storage, which I’m always up for. I’m thinking something like this IKEA hack using Expedit shelving. I would choose another fabric, but I would like something like it with a cushion seat and padded seat back. I also heard that Expedit is being discontinued, so I’m wondering if could the materials for cheaper? Hmmm. Otherwise I would build it from scratch, but that would be a bit more time-consuming. What do you think about banquettes? Yah or Nay? Every once in a while I come across something which allows the science-y part of my brain to collide with the design part of my brain. I love it when that happens. Today’s “Convert It” post is one of those moments. Let’s start by admiring these beautiful soft grey tiles by Fireclay Tile, shall we? Lovely right? Well my friends, you are about to love them even more. These gorgeous tiles are made from recycled CRT (Cathode Ray Tube) glass. CRT glass which was originally developed to create a way for projecting images onto a screen and up until not too long ago most TV and computer screens were made with this technology. CRT glass is exceptionally thick and shatter resistant which also makes is very difficult to recycle. Fireside Clay decided there had to be a way to deal with this waste. So they created “Phosphor” tile made from the CRT glass. They work with a e-waste company who provides them with the CRT glass. They then heat it up and crush it into a soft powder so it can be melted into these awesome tiles. They started a Kickstarter campaign to raise the funds to buy the new molds required to make these tiles and met their goal in December. And these recycled CRT tiles will be available for sale in Spring of 2014. You can read more about this on Inhabitat, where you will find a great infographic showing company’s purpose and process for these CRT tiles. Don’t you just love a product created with a boatload of ingenuity? Sometimes you come across a space that is just simple and comforting. One of these spaces is the apartment of Kerri Russell. Aside from being an actress (ahem, namely the star of one of my favorite shows ever, Felicity) she obviously also has a keen eye for design. Lots of natural materials and neutral colours make her Brooklyn apartment very cozy, but its the interesting design features like the fixtures, lighting and art that give this space high style. I really, really want to have a soak in her tub….which says a lot since I don’t even like baths! Also, all the natural light in this space is phenomenal. Lovely indeed. Since was talking about the Eames molded plastic chair in my last post, I thought it seemed appropriate to have Charles and Ray Eames as the subject of today’s Masters of Furniture post. So I’m a little embarrassed. 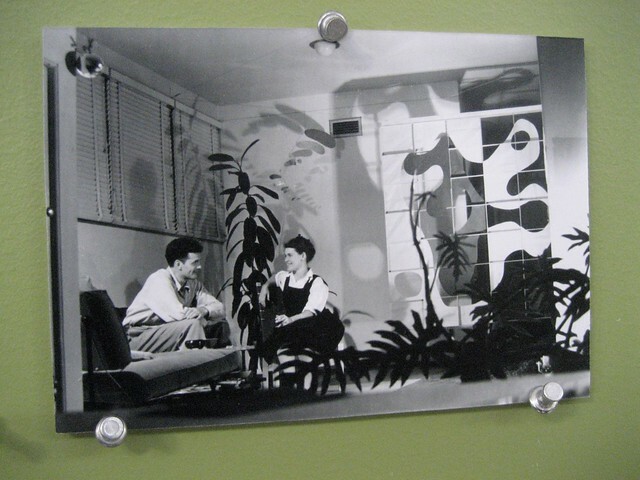 Although I know their designs very well it was only this week that I discovered that Charles and Ray Eames are in fact a husband and WIFE team, not two brothers. Ray is woman. Perhaps everyone else knew that already, but I had no clue. But I suppose this is why I’ve been posting this series, to learn more about these designers. Charles Eames, Jr was born in St. Louis, Missouri. Charles studied architecture for two years at Washington University in St. Louis on an architecture scholarship. and then left the university. Many sources claim that he was dismissed for his advocacy of Frank Lloyd Wright and his interest in modern architects. However, less publicized sources indicate he left because couldn’t balance his studies with his part-time work at a local architecture firm.While at Washington University, he met his first wife, Catherine Woermann, whom he married in 1929. They divorced in 1941. They had one daughter. Charles worked in his own architecture firm in St. Louis until Finnish architect Eliel Saarinen (one of his great idols) invited to further study architecture at the Cranbrook Academy of Art. He became a teacher there and later the head of the industrial design department. Ray Kaiser, born in California, graduated from Bennett Women’s College in Millbrook, New York, and then moved to New York City, where she studied abstract expressionist painting with Hans Hofmann. In 1940, she began studies at the Cranbrook Academy of Art. That is where magic began! Charles had became close friends with Eliel’s son Eero Saarinen and together they designed prize-winning furniture for New York’s Museum of Modern Art “Organic Design in Home Furnishings” competition. Their work displayed the new technique of wood moulding. Ray was working on design drawings for the competition. Charles and Ray married a year later to Los Angeles where they would continue designing furniture. I’ve highlighted some of their most famous and influential designs below which are still in production to this day by Herman Miller. You will recognize most of these pieces, in particular the iconic Eames lounge chair and ottoman. They also designed some toys using molded wood, like the Eames Elephant! Outside of furniture design they were still involved in architecture projects. Most notably, Charles and Ray designed and built the Eames House, as part of Arts & Architecture magazine’s “Case Study” program. Case Study House #8 was hand-constructed in a matter of days out of entirely prefabricated steel parts and it is considered to be a milestone of modern architecture to this day. The couple also were involved in other creative ventures over the years such as films and textile design. Charles Eames died in 1978 and Ray died 10 years later. You can read much more on the Eames and their designs here. Even if modern mid-century style pieces aren’t your go-to design style, I think most people can certainly appreciate how much the Eames designs have influenced today’s modern furniture design. You can see my two previous Masters of Furniture Posts, here and here.